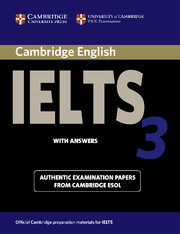 Cambridge IELTS 3 provides students with an excellent opportunity to familiarise themselves with IELTS and practise examination techniques using authentic test material. This collection includes practice in the updated Speaking test (June 2001 syllabus), plus extra Reading and Writing modules for General Training candidates. 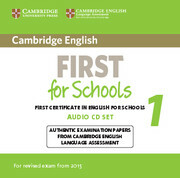 The book includes an introduction to these different modules together with an explanation of the scoring system used by Cambridge ESOL. The comprehensive section of answers and tapescripts means that the material is ideal for students working partly or entirely on their own. A self-study pack (Student's Book with answers and Audio CD) is also available.  Contains four model papers prepared for publication by UCLES, including practice in the updated Speaking test (June 2001 syllabus).  Includes helpful information on marking and interpreting scores to give an Overall Band Score.  Features authentic and model answers for the Writing paper, together with examiners' comments.